A two bedroom cabin that contains bathroom facilities, self-contained kitchen and combined lounge/dining area. Private front balcony with barbecue. Linen is provided on existing bedding free of charge. Can sleep up to six people with the use of a double sofa bed. Peaceful, natural surrounds at South Currigee Campgrounds only. Onsite Hut accommodation that sleeps either two or four persons. Tipplers Campground offers four Wallaby Tents, three of which sleep four people and the other only two people. 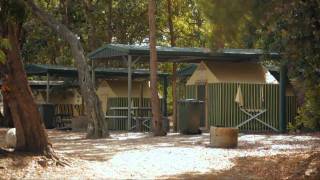 South Currigee Campground offers six Wallaby Tents that sleep four people and one Tent that sleeps two people. Campground facilities at Tipplers and South Currigee include shower and toilet amenities, gas barbecues, children's play areas and kiosks providing basic groceries and camping supplies. Tipplers Licensed Cafe is now open for breakfast, lunch and dinner on weekends, as well as Queensland school and public holidays. Camping sites of varying size are available at all four camgprounds. At Tipplers up to 100 tents may be accommodated, at North Currigee up to 20 tents and at South Currigee up to 60 tents. North Currigee is located around an inlet ideal for mooring boats. This site has cold showers only. Gas barbeques and children's play equipment are only available at Tipplers and South Currigee, as well as kiosks providing basic groceries and camping supplies such as ice and firewood. Tipplers Licensed Cafe is open for breakfast, lunch and dinner on weekends, as well as Queensland school and public holidays.